Looking for a quick mid week meal? You can’t go past this pesto pasta recipe! Combine basil, pine nuts, garlic, parmesan in food processor. When well combined, gradually add olive oil in a gentle stream with motor still running. Cook pasta according to packet instructions. Drain water off the pot, leaving approximately 1/4 cup water with pasta. Add butter and pesto to pasta while pot is still hot. Combine well. Add salt and pepper to taste. Serve hot with parmesan cheese garnish on top. Ohh yes. Love pesto and love pasta. The dish for me. Thanks for the recipe. Pesto is so easy and versatile. A great recipe! Mmm nice and simple yet so delicious! Thanks for sharing! This looks AMAZING!! I will be sure to get all the needed ingredients the next time I am at the store and give it a try. Thanks for sharing! This is on my list to try this week for dinner! This looks amazing. I’m so hungry just looking at it. Love pesto pasta. Eggplant in the oven also makes a lovely addition, as some zucchini and carrot cooked in ghee/coconut oil in the pan – great to add more veggies AND it tastes amazing. Pesto pasta looks perfectly divine! I love pasta with pesto. Sometimes I add some cherry tomatoes and they taste quite good together. A big yes! to the cherry tomatoes! 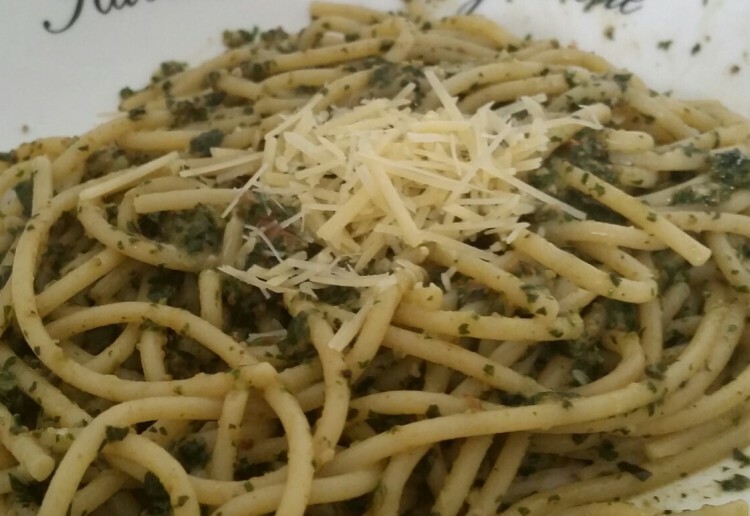 The pesto pasta look’s fantastic,will add the ingredients to my shopping list! Thanks so much!